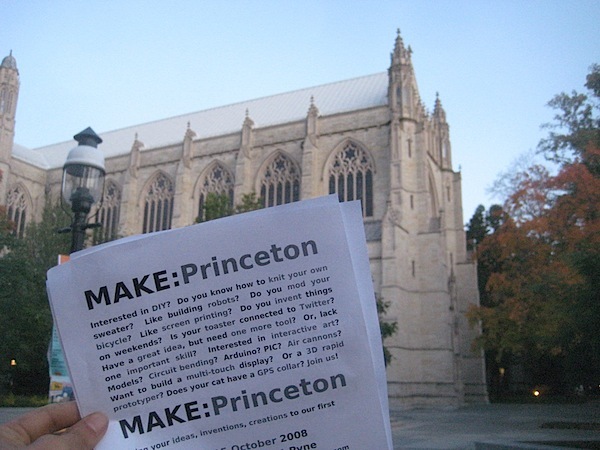 I am happy to announce that the first meeting of MAKE:Princeton was an incredible success! Perhaps 10 people showed up from as far away as Jackson, Ewing and New Brunswick, New Jersey, and even Yardley, PA!. Several people brought projects for show and tell. Bill showed us his HF Start for his Tig Welder. He effectively turned a $200 welder into a $1000 welder. Jon showed us his new USB RFID reader. He toyed around with all sorts of ideas, even crazy user interfaces build around RFID dice. I showed off my alarm clock, and Ian was kind enough to show us the diy Jukebox and arcade game that he built with his brother. Each of these has an embedded computer and incredible craftsmanship. He said he engineered the arcade game so it could be disassembled and transported in a car. The next meeting will be in two weeks. Same bat time, same bat channel.